In the upcoming season, Moscow audiences will be able to see Tchaikovsky’s “Iolanta,” works by Shostakovich, Handel and Donizetti, and a special event commemorating ballerina Maya Plisetskaya at the Bolshoi Theater, while the troupe will also visit London for a three-week tour. 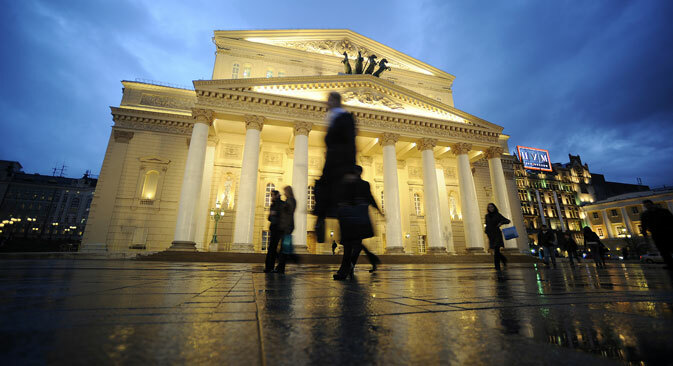 The Bolshoi Theater has announced its plans for the 2015/16 season, with the company set to present six opera and three ballet premieres, as well as a summer tour to London, a collaboration with the Hamburg Ballet and a memorial evening devoted to recently deceased ballerina Maya Plisetskaya. In October, the theater’s historic stage will premiere Tchaikovsky’s Iolanta. “According to the composer’s design, this opera will be accompanied by a symphonic suite from the ballet The Nutcracker,” said Bolshoi director Vladimir Urin, commenting on the opera at a press conference devoted to the 2015/2016 program. Originally, Tchaikovsky planned these works to be combined in one evening. It seems that the idea to embody his plan is in the air, as the Paris Opera has already announced the premiere of The Nutcracker and Iolanta directed by Dmitry Chernyakov, to take place in the spring of 2016. Moscow will unveil its version before Paris, but the Russian production will be less radical; there will be no dance in The Nutcracker. The suite from the ballet was compiled by the project's musical director, Vladimir Fedoseyev, and will be directed by renowned theater director Sergei Zhenovach. In December, the New Stage will host a Baroque opera, a rare staging at the Bolshoi. Handel’s Rodelinda is a co-production with the English National Opera, which has already enjoyed resounding success in London. It will be staged by the British team – conductor Christopher Moulds and director Richard Jones. February will see the performance of Katerina Izmailova, the later version of Shostakovich's opera Lady Macbeth of Mtsensk, which will be staged by another eminent theater master, Rimas Tuminas. In April 2016, the New Stage will host the premiere of Donizetti's Don Pasquale, to be directed by Timofei Kulyabin, whose name is well-known to Russians due to the controversy surrounding his recent production of the Richard Wagner opera Tannhäuser in Novosibirsk. "Negotiations with Timofei Kulyabin were held long before the staging of Tannhäuser. I think it could be an interesting, lively production," said Urin. The season will be concluded with the staging of Hector Berlioz’s “dramatic legend in four parts” Damnation of Faust under the musical direction of Sokhiev and direction of Germany’s Peter Stein. In addition, Tchaikovsky’s Eugene Onegin is to return to the repertoire of the Bolshoi Theater: Director Dmitry Chernyakov will stage a complete revival of the production with a new cast. On Nov. 20, the Bolshoi Theater will celebrate the 90th anniversary of the birth of ballerina Maya Plisetskaya, who died on May 2. However, the theater will try to avoid a mournful tone, presenting the evening as it was planned by Plisetskaya herself just two weeks before her death. Svetlana Zakharova will present her recital on May 24-25, 2016 as three premieres – new one-act ballets to the music of Tchaikovsky, Handel and Mozart. An evening of ballets by contemporary Dutch choreographers will take place on the venue’s historic stage on March 18 – a principled choice by Bolshoi director Urin, who does not want to exile present-day works to the New Stage. Finally, at the end of the season, the Bolshoi Ballet will present the grand world premiere of a domestic choreographer; the multiple winner of the Golden Mask Award and artistic director of the Yekaterinburg Ballet, Vyacheslav Samodurov, will stage the three-act ballet Ondine based on the music by Henze and with his own libretto in June 2016. Meanwhile, the Bolshoi will continue its tradition of active collaboration with foreign theater companies. In January the Bolshoi will host the Hamburg Ballet under the direction of the American choreographer John Neumeier. The German troupe will perform two of Neumeier’s productions – A Cinderella Story and Romeo and Juliet. And six months later, on July 25, 2016, the Bolshoi will embark on a three-week tour to London, featuring five ballet performances. Based on Kommersant and TASS reports. View the infographics: "Bolshoi theater: 190 years of high art in Russia"